Established in April 2019, Medaltime brings together an already well established and professional admin team specialising in custom made medals with Paul Selby, founder of 1000km Promotions, who supplied the world market with medals from South Africa for nearly 25 years. 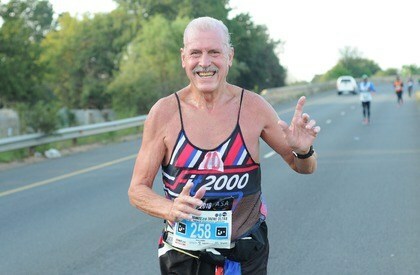 Paul’s involvement with running dates back over 35 years. Having emigrated from the UK to South Africa in 1971 Paul established his own engineering company and in 1983 entered a team for a company relay. Having painstakingly completed an 11km leg, he had been bitten by the ‘running bug’! Notable achievements include 24 Comrades Marathons including a 180km Comrades Back to Back which he ran in 1999 for charity along with a 1000 mile in 1000 hours event also for charity in conjunction with the Flora London Marathon in 2003. Add to this 6 Iron Man and a current tally of 685 marathon and ultra-marathons, not to mention several thousand shorter events, Paul has one of the largest world collections of medals in his locker! During Paul’s early running days he recognised the poor quality of medals in the market and decided to do something about it and went into production! So he asked, “What medal would I wish to receive when completing the event?” and applied this ‘acid test’ to all race organisers he came into contact with. Paul prides himself that while supplying several million medals into the world market each year, he never let anyone down by seeing each and every order right through to its final destination. Paul has recently undergone several health issues but is currently back on the road training for his 25th Comrades Marathon. Paul’s slogan is, “My Passion – Your Pride” so you can be sure that Medaltime will supply well priced, good quality medals well on time! Click here for a more in-depth story about Paul. Click here for a copy of the AIMS editorial from the first edition of Distance Running 2019. Click here for a copy of an editorial from the Comrades Marathon Souvenir Programme. Medaltime is part of PROM'ES B.V., a company that specializes in supplying products and services to running and cycling events. Started with just number bibs, our portfolio has grown to a complete set of products and services. So, are you looking for race numbers, fulfilment solutions, T-shirts / team wear, warning foil or timing clocks, then take a look at www.eventsupplies.nl/en. Over 20 years, PROM’ES proved itself as a reliable partner in Event Supplies for events throughout Europe. The organization is characterized by an accurate and service-oriented attitude of our employees where honesty and commitment are core values. That's who we are! We welcome any order and we are only satisfied when you are completely satisfied. Our clients appreciate our approach and open communication. We have a lot of customers that we work for since many years. AIMS has firmly established itself as the major force behind the development and progress of distance running throughout the world. From an initial membership of 28 in 1982, it has grown to over 400 countries and territories including most of the world's premier marathons and many other major road races. 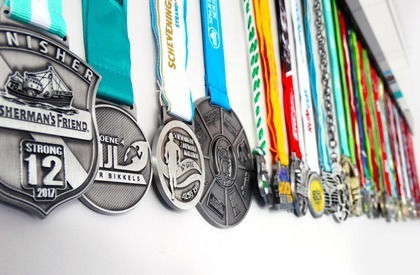 We are proud to be the official partner of AIMS for unique custom made medals. For more information about AIMS, visit http://aims-worldrunning.org. Fill in this form and we will contact you as soon as possible to make an appointment. You are very welcome at our office, but we can of course visit you as well. We would be very happy to introduce our unique medals, without obligation.